18 Records Returned 10 Records Displayed. 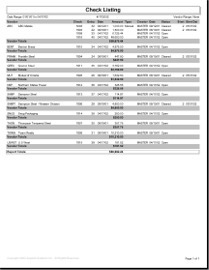 Description: Prints detail of posted Vista Accounts Payable checks. 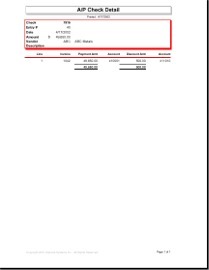 Description: Vista Accounts Payable Check Edit Listing printed by vendor name. 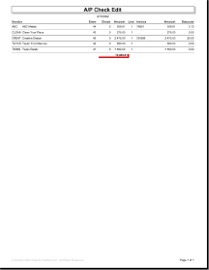 Description: Accounts Payable Check Listing by vendor or check number with vendor and date range. Option to print only uncleared checks, or all checks for use with Vista Check Reconciliation function. 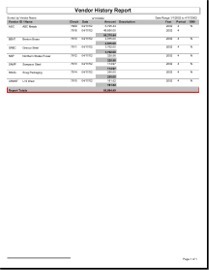 Description: This Vista report is a great tool for month end reconciliation, and can be run by Vendor or Check number. An optional summary report is provided to display a summary by GL account for all checks or a summary by vendor. 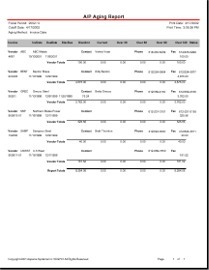 Description: This Vista report shows all Accounts Payable check transactions for a user defined vendor and date range. Description: The Accounts Receivable and Accounts Payable close month functions in Vista to close all paid transactions regardless of fiscal period. 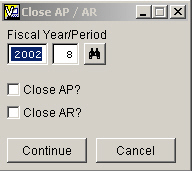 This program allows you to close A/R and/or A/P for just the Fiscal Period specified.